In garden design, the term "bones" refers to something architectural that defines the structure of a garden. Think of bones as the skeleton or framework for your garden's look. They can be features on their own or used to move the eye from one part of the garden to another. Garden bones can be artificial, such as an arbor or obelisk, or they can be a plant. Very often evergreen trees or shrubs are used. Evergreens delineate the garden no matter the season, standing out equally well in the profusion of summer and against a backdrop of snow. Large-scale gardens have successfully used evergreens in mixed borders for centuries. It is fairly recent that home gardens have developed an enthusiasm for including them in more modest garden designs. 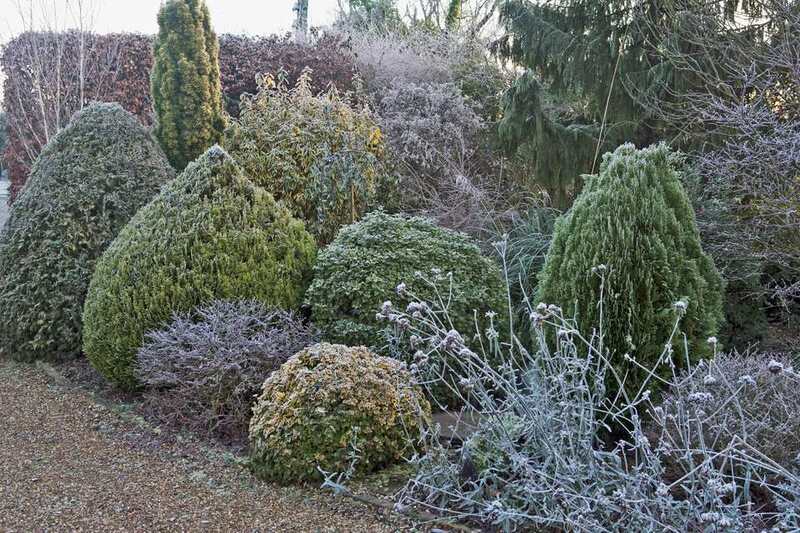 Part of the recent popularity of using evergreens as the garden's bones is due to the wonderful variety of dwarf evergreens currently on the market. Dwarf conifers are evergreen trees and shrubs that have either a mature height of fewer than 12 feet or are so slow growing that the garden will probably be long gone before the evergreen outgrows it. Even if a grouping of containers on your deck or patio constitutes your garden, the same great features of dwarf conifers apply. The ideal time to plant conifers is while they are dormant in October through March. Most prefer full sun and slightly acid soil. Because they grow so slowly, no fertilizer except healthy soil should be necessary. Also because of their slow growth, dwarf evergreens are expensive to propagate and can be expensive to buy. Be sure to buy from a reputable nursery with a 1- to 2-year guarantee. Abies balsamea "Hudsonia" (1 foot tall and 2 feet wide) This tiny, slow-growing balsam fir is perfect for small gardens and landscapes. And as anyone who has had a balsam Christmas tree can attest, balsams are among the most pleasantly aromatic evergreens. It grows in zones 3 through 7. Chamaecyparis lawsoniana "Minnima Aurea" (2 feet tall and 1 foot wide) This is a beautiful bright yellow false cypress with a pyramidal shape that lends some height to the garden. Easy growing, but like most Chamaecyparis, it does not like exposure to strong winds. It grows in zones 4 through 8. Juniperus communis "Compressa" (3 feet tall and 1.5 feet wide) There are so many wonderful compact and creeping junipers. "Compressa" is a dense, columnar dwarf tree that brings formality to a garden design. It grows in zones 2 through 6. Juniperus squamata "Meyeri" (3 feet tall and 2 feet wide) The drooping almost shaggy nature of "Meyeri" is an eye-catcher. It has a nice cool, blue color, but can develop brown patches on older growth, that will need to be kept trimmed. It grows in zones 5 through 8. Picea glauca albertiana "Conica" (4 feet tall and 2 feet wide) The dwarf Alberta spruce is deservedly one of the most popular dwarf evergreens. It keeps its perfectly conical shape without effort and its new spring growth is bright lime green. It grows in zones 4 through 7. Pinus mugo "Gnom" (2 feet tall and 4 feet wide) Mugo or mountain pines are finally getting their due, with several excellent varieties on the market. They form low, mounding, almost bonsai-like structures in the garden. It will grow in almost any type of soil. It grows in zones 3 through 7. Pseudotsuga menziesii "Fletcheri" (3 feet tall and 5 feet wide) Furrowed bark, long, blue-green needles, and a flat top make this dwarf Douglas fir an excellent focal point. "Fletcheri" likes to spread out, but it will not get anywhere near as tall as its non-dwarf cousins. It grows in zones 4 through 7. Thuja occidentalis "Hertz Midget" (1 foot tall and 1 tall wide) "Hertz Midget" is one of the smallest evergreens you will find. It grows as a tight, round ball with the feathery arborvitae needles. A good choice for a small garden, it easily tolerates some shade. It grows in zones 2 through 8. Thuja occidentalis "Rheingold" (3 feet tall and 3 feet wide) "Rheingold" looks like someone brushed its branches straight up, giving the round shrub a more conical appearance. Its rich, gold color mellows to copper in the fall. It grows in zones 3 through 8. Tsuga canadensis "Pendula" (3 feet tall and 8 feet wide) Tsuga canadensis means it is a Canadian hemlock, and that means this tree is hardy. With the name "Pendula," it is a weeper. It is also a stunner if given the room to spread out, especially if it can drape over a wall. It grows in zones 3 through 7.